We provide an amazing seaview dorms and variety of accommodations that you will enjoy our famous pool party with social & fun atmosphere on every Tuesday, Thursday and Sunday starting from 1-9 PM as FREE ENTRY. Ibiza House is located in party area (Loh Dalum Bay) which means the surrounding area is full of loud music until 2 AM, but it does not affect much for our accommodations. Please note that this hostel is on the beach front so, you cannot avoid sand reaching into your room. However, we will do our best to keep it clean. 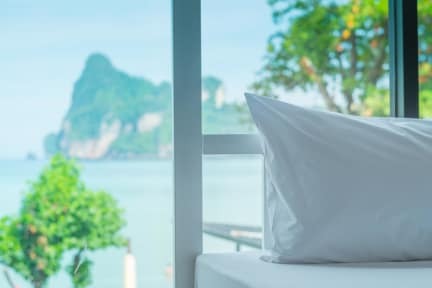 We offer clean several room types which are mixed gender dorms, with 10-beds standard dorm, 4-8 beds pool side dorm, 8-10 beds seaview dorm in different price. 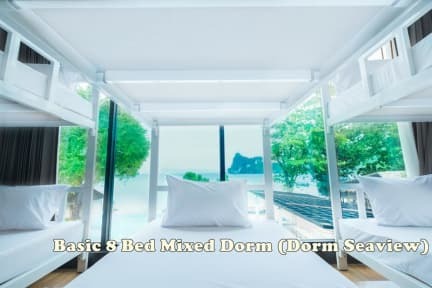 All dorms are individual air-con room with hot showers, clean mattress, own electrical socket, shared bathroom, FREE WI-FI, CCTV & 24 hours security guard, safety deposit box individually, daily cleaning service, and FREE ACCESS TO SEAVIEW POOL. For whom it may interest in private room we also provide LUXURY VILLAS with PRIVATE POOL that is quiet and relaxing recreation. We welcome all Phi Phi island's tourist to join our POOL PARTY on every Tuesday, Thursday, and Sunday from 1-9 PM, that is good opportunity to meet new friends, enjoy cool music, Beer pong game, and a variety of drinking (reasonable price). However, our in-house guest can access pool for free every day. Our location is next to beautiful beach that have many comfortable facilities such as seaview restaurant, pool bar, beach bar, tourist information, currency exchange, ATMs, and mini-mart. Our staffs are friendly and willing to respond our valuable guests every requirement to meet highly satisfactions. The islands and sunset will always be right here, waiting for your visit and exceeding a sense of novelty!